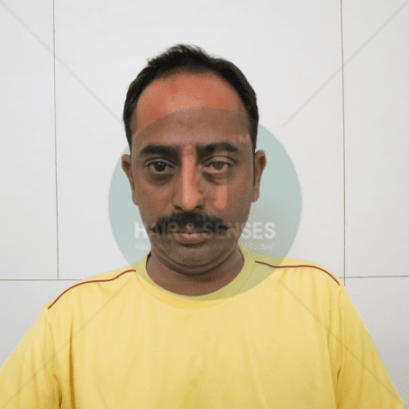 Mr. Girish Chawdhary, a 35 years old person came to our clinic for the hair problem. He has lost hairs from the front portion of the scalp and wanted to get it filled. He got the reference of our clinic from one of his colleague who underwent hair transplant at our clinic a year back and was very satisfied with the result. On history taking, Mr. Girish had a history of thyroid problem three years back for which he was treated by endocrinologist. His thyroid hormone levels are normal now and he is not taking any medications. No other significant medical or surgical history found. On examination, his hairloss was found to be around Norwood 3 scale. Scalp condition was healthy and donor area density was also adequate. We suggested him Hair transplant by FUE technique. Here is the day one of the surgery when the hair transplant journey of Girish chawdhary started with Hair & Senses. The complete procedure is done in single day session. The journey will be continued and we will share more once the patient visit next to us.